But true: The New York Public Library is facing a $37 million budget cut, the largest in its history. Six-day service could be cut to four days. Job search services and tons of programming could be eliminated. Ten branches are threatened with closure, including (rumor has it) the Ottendorfer — ours. The Ottendorfer is the oldest free lending library in New York City, as well as the oldest branch of the New York Public Library still in its original building. It was built in 1884 with support from philanthropist Anna Ottendorfer, a German-American newspaper publisher; it’s a super-nifty-looking, ornate, ungapatchka building. My kids adore the children’s librarian there, Miss Thea. Maxie loved a program with the Lower East Side Ecology Center, learning to compost with worms; Josie enjoyed R.E.A.D. with Mudge, a program in which therapy dogs (R.E.A.D. stands for Reading Education Assistance Dogs) cuddle with kids; research has shown that reading aloud to animals helps kids feel more confident in their literacy skills. And of course, when we go into the building in the winter we see many homeless and poor New Yorkers who rely on the library as a place to read and get warm. 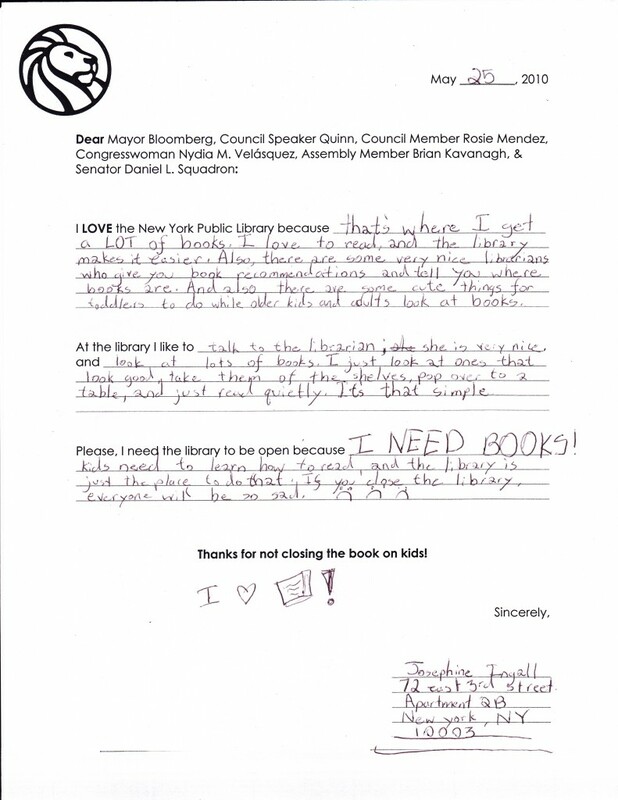 I hate to bellow SAVE OUR LIBRARIES when I know so many institutions (including my kids’ own public school) are threatened with massive cuts, but the library does so much good for so many New Yorkers! I’m heartbroken over the pending slashes at NYC libraries. Maybe I’m being myopic but why does it seem like the cuts are coming from schools and libraries and transit services and all the things that are so supremely necessary to citizens? Interesting side note: a friend of mine who is an NYPL librarian noted how all the endowment monies go to the big “library centers” SIBL, Shomburg, etc. but never to the branches, which is where New Yorkers actually go to use the libraries.